Zaanse Schans is a neighbourhood of the town of Zaandam, located near to Amsterdam. The Zaanse (Zaan river) Schans (sconce) was originally a fortification against the Spanish during the Eighty Year’s War for Dutch independence. 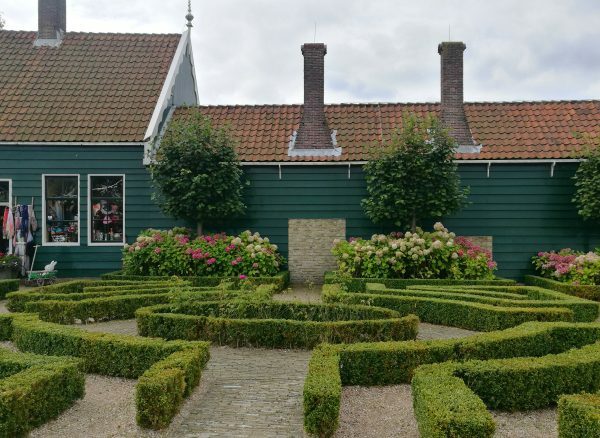 Between 1961 and 1974 a number of historic buildings were re-located here and the area is now a major tourist site featuring preserved traditional Dutch windmills and a number of museums depicting early life in the Netherlands. 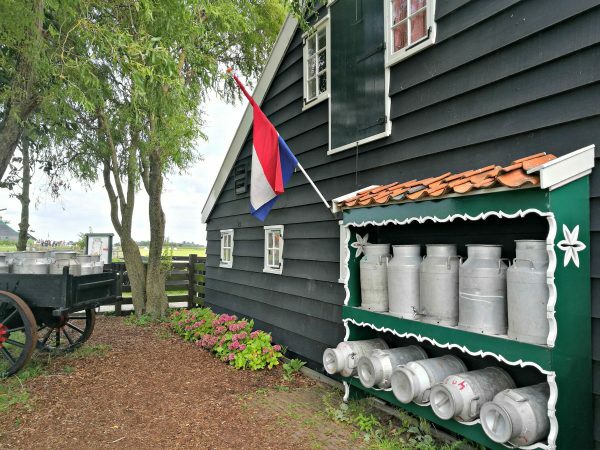 The site receives more than a million visitors each year and it’s easy to see why; the neighbourhood is picturesque and gives visitors a taste of traditional Dutch country life away from the hustle and bustle of the major cities. 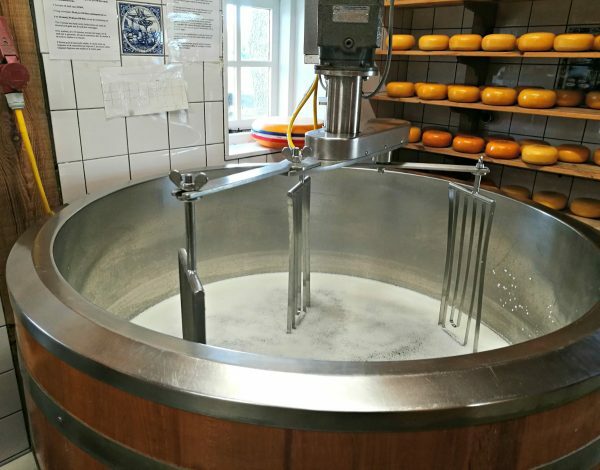 Here you can see cheeses being made (and taste many different varieties), find out about traditional ways of making clogs and barrels, and even try your hand at making traditional Dutch chocolate. Located so close to Amsterdam it’s a great place to visit to enjoy the scenery and learn about Dutch history and culture. It’s also very possible to have all these experiences without spending much money! 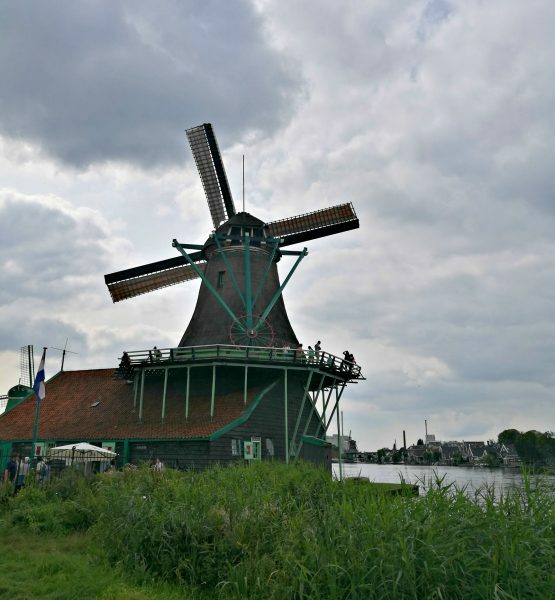 Read on to find out my best tips for visiting the beautiful Zaanse Schans on a budget. 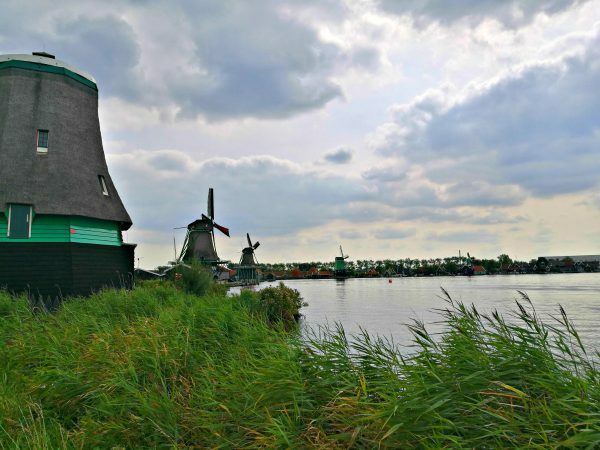 Located very close to Amsterdam, Zaanse Schans is very easy to get to by train or car. 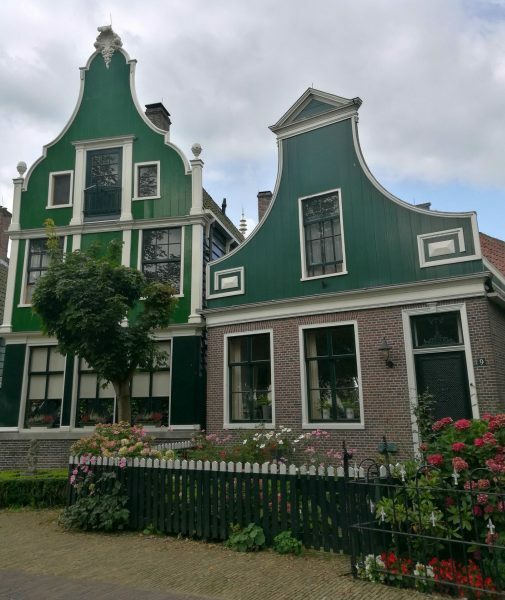 If you are based in Amsterdam you can catch an 18 minute train from Amsterdam Centraal to Zaandijk Zaanse Schans for only €3.10 each way! From the station it’s only about a ten-minute walk to the Zaanse Schans site, and if you travel outside of peak hours you can also take your bike and use that to get around – there are lots of bike paths around Zaanse Schans and you can also explore the town of Zaandijk if you wish. If you have a car there is ample parking on the site, although it will cost you €10. This is a flat rate though, so you can stay as long as you like and explore for hours! 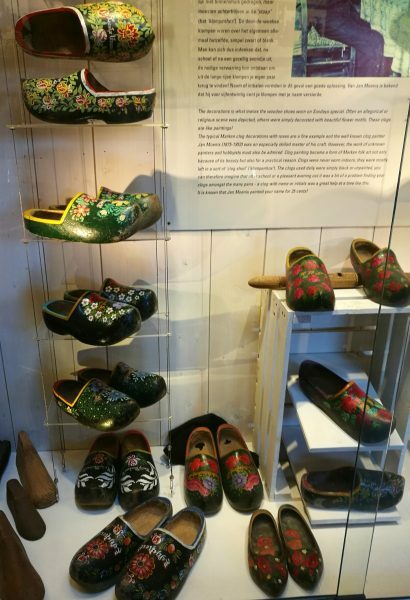 In this museum you can learn about the Dutch footwear: clogs! 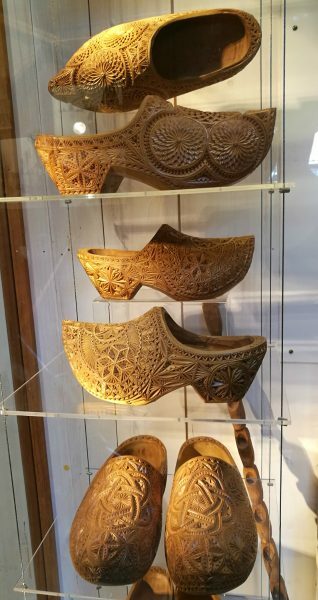 Watch a demonstration of how clogs are made, read about the history of clogs and clogs that are made for special occasions (like the carved bridal clogs above right) and even buy yourself some clogs in the gift shop if you want. Don’t forget to take advantage of the cheesy photo opportunities outside as well! 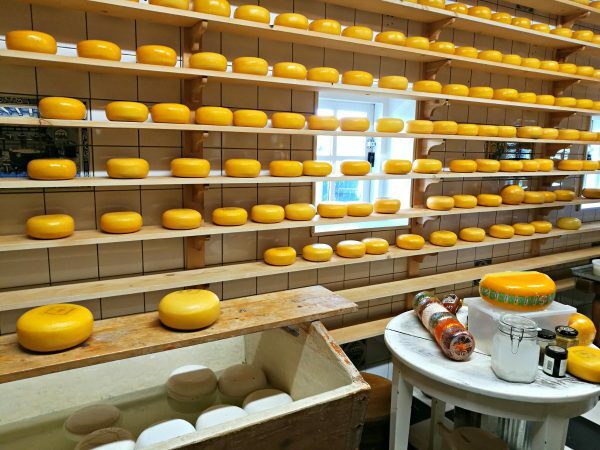 This replica of a traditional cheese farm shows how cheese is made and has hundreds of different types of cheese (and mustards and other treats) for display and for tasting. Staff wearing traditional cheese maker costumes can tell you all about the different types of Dutch cheese as well as daily demonstrations of the cheese making process, and of course, lots of testing trays! As soon as you arrive at Zaanse Schans the first thing you notice is the delicious scent of chocolate wafting through the air. You can follow your nose to this tiny little cocoa lab and try your hand at making your own chocolate or chocolate drinks (for a fee) or simply marvel at the many chocolate moulds and produce on display. You will be sorely tempted to try some of the mouth-watering products available here, I especially recommend the Tony’s Chocolonely bars; a Dutch company and the cocoa lab has a fantastic variety of flavors to choose from! Or you can simply sit outside all day and enjoy the tantalising aromas! Albert Heijn is one of the biggest Dutch supermarket chains, and here you can see the humble beginnings of this Dutch grocer’s shop. 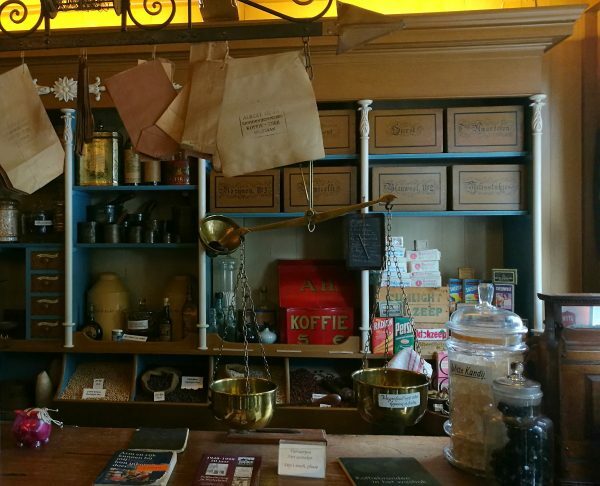 Complete with original furnishings and stock, and a very friendly old Dutch man to ask questions of, you can take a step back into the past and pretend you are doing your grocery shopping in the 1880s. 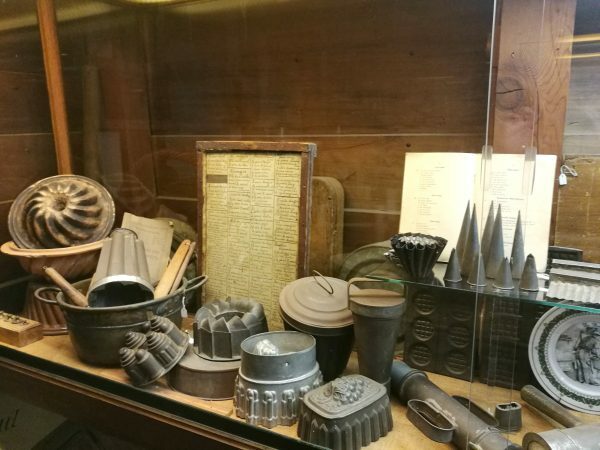 This little bakery museum dates from 1658 and features a fascinating collection of old baking tools such as cake moulds, recipes and a massive standing mixer! 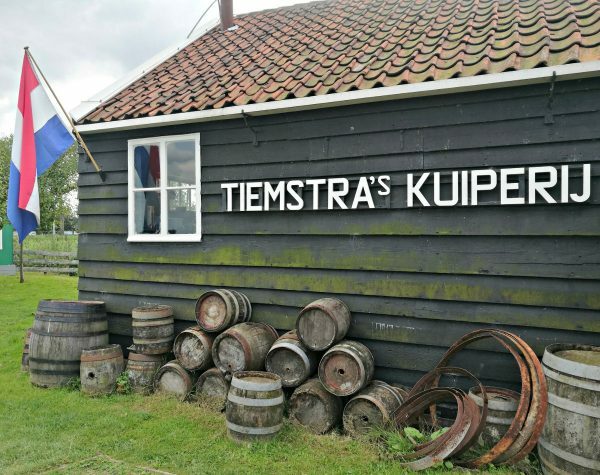 The name of the museum comes from the Duivekater, a famous Zaanse sweet bread which you can buy fresh and warm here, as well as waffles and other traditional Dutch baked goods and sweets. There is an old-fashioned sweet shop at the front, then the bakery with museum as the back. 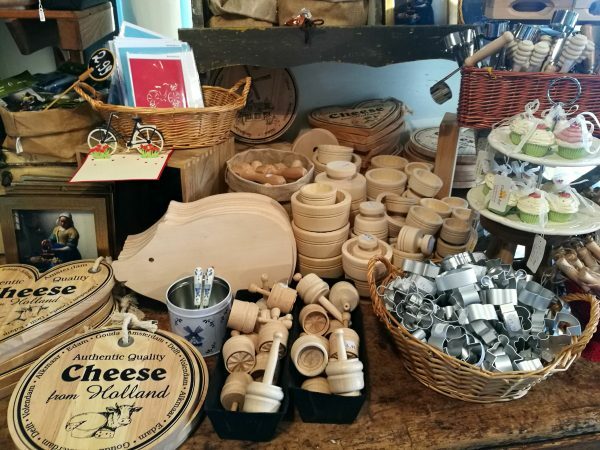 There are also lots of charming baking themed goods to buy, as well as special Dutch cookbooks and a sweet little cafe area to sit in if you choose to buy something to eat. 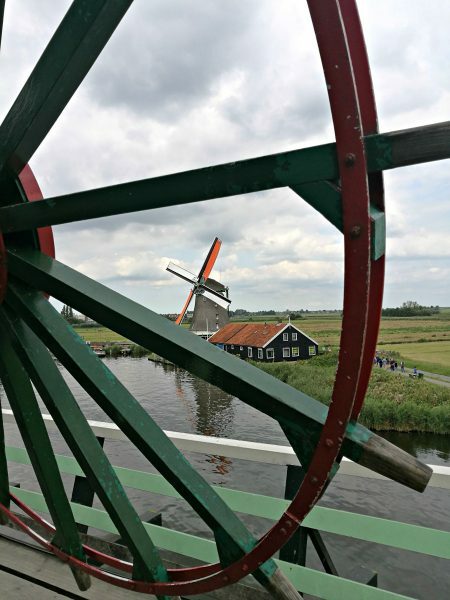 Of the eight preserved windmills at Zaanse Schans, De Huisman (on the right above) is the only one you can visit inside for free. 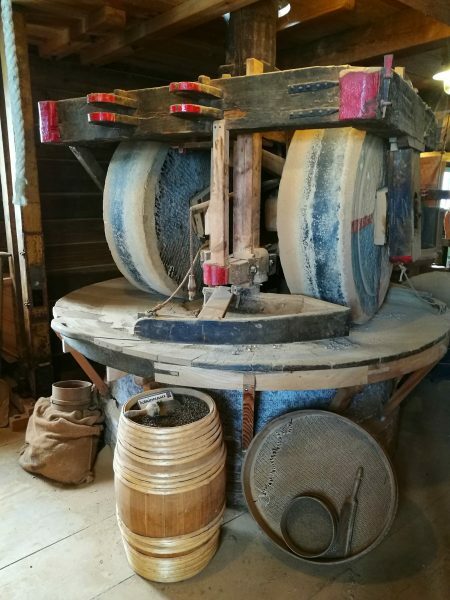 De Huisman (The Houseman) is a mustard mill and when you go inside you can see the original grinding stones and read information about its use for milling spices in the past. 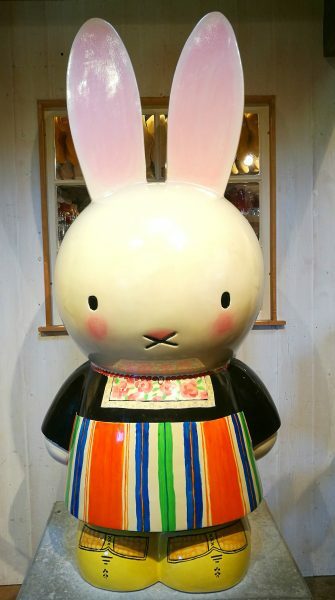 You can also use your nose to identify different spices which is quite fun, and, of course, buy souvenirs if you feel like it! As well as the above free attractions there are also quite a few shops that are free to have a look around in as long as you don’t buy anything! 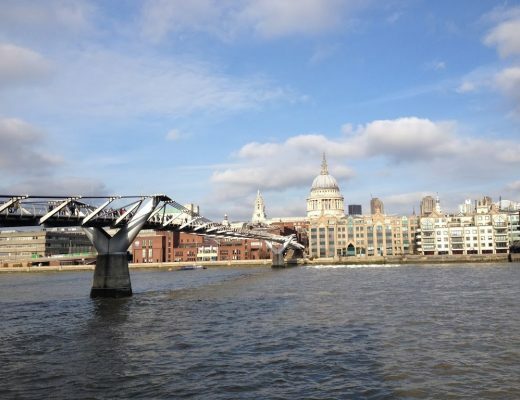 There are numerous souvenir shops, a jewellery store and an antiques shop. 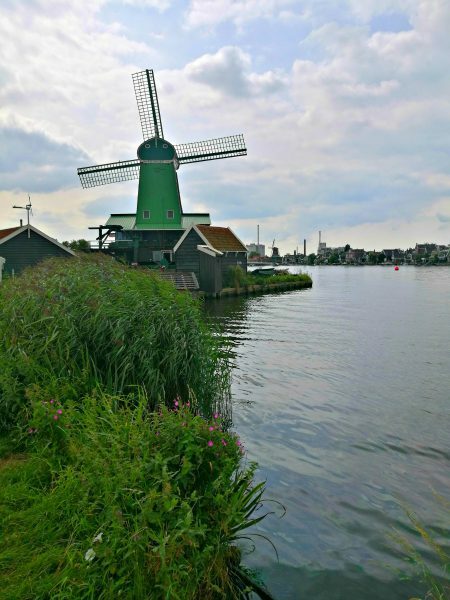 Walking around the lovely old wooden buildings and garden areas are also free, as is wandering along the river and seeing the rest of the windmills from outside. This is partly what I enjoyed the most, as the area is very picturesque and some of the houses are actually residences. So while you should be respectful of the people who live here, it is also very enjoyable to see lived-in traditional buildings and gardens. 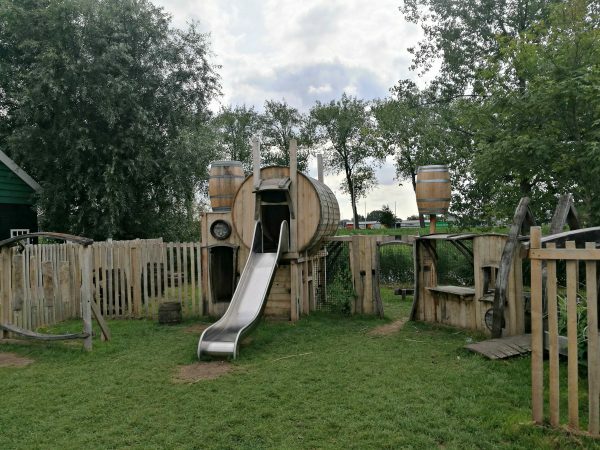 While the coopery below costs money to visit and learn about barrel making, the barrel-themed play area outside for children is perfectly free, and also looks quite fun! 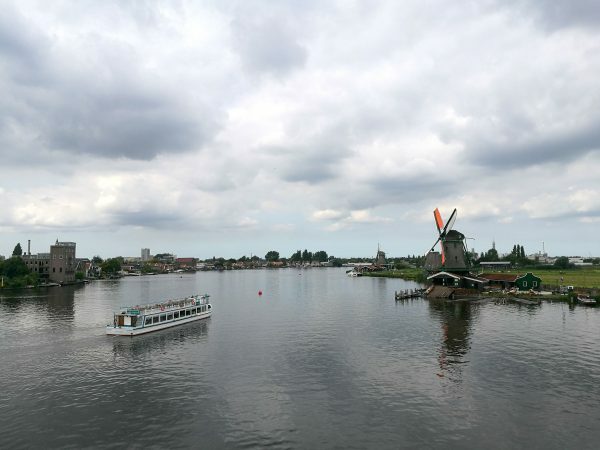 The windmills are the biggest drawcard and the walking path along the river lets you see them all while also having an enjoyable walk. There are seats along the way, and sitting here and looking at the rest of the pretty town of Zaandam across the river is also very nice. If you want to pay to go inside another windmill I would recommend De Kat (the cat) because you can climb up and go outside on the balcony, and it seems to be the highest balcony of all the windmills that have them here. Be warned, the stairs are VERY steep (more like a ladder) so you need to be mobile enough to climb up and then climb down again; this is not an easily accessible windmill! It costs €4 per adult to go inside any of the windmills that are open (they’re not all open every day). The views from De Kat were very nice and I didn’t fall down any stairs (always a real concern with me!) 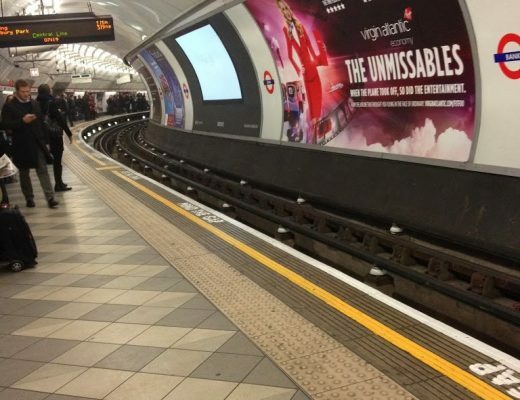 but you might not think €4 per person is really worth it. De Kat was a dyemill, so there is some interesting information about the materials used to create dye, and you see the mill mechanisms as well but it’s not a big display, you mostly go for the view. So all in all, for our visit to Zaanse Schans for two persons we spent €18; €10 for parking and €4 each to go into De Kat. If you are coming by train it would probably be even cheaper minus the costs of whatever food you bring along. 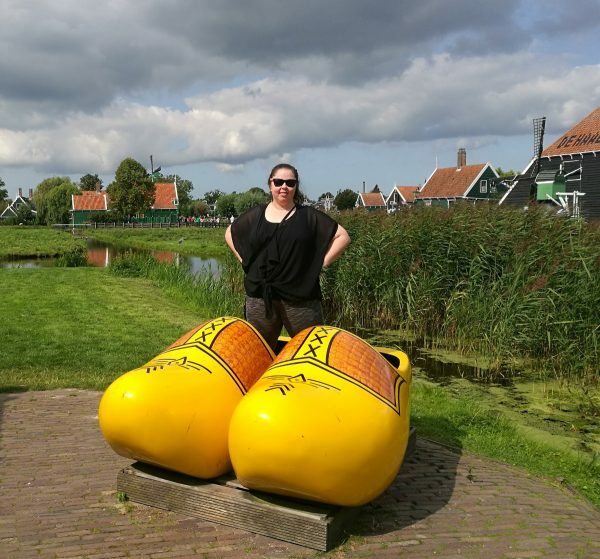 It is definitely easy (and still very fun) to visit Zaanse Schans without spending much money! 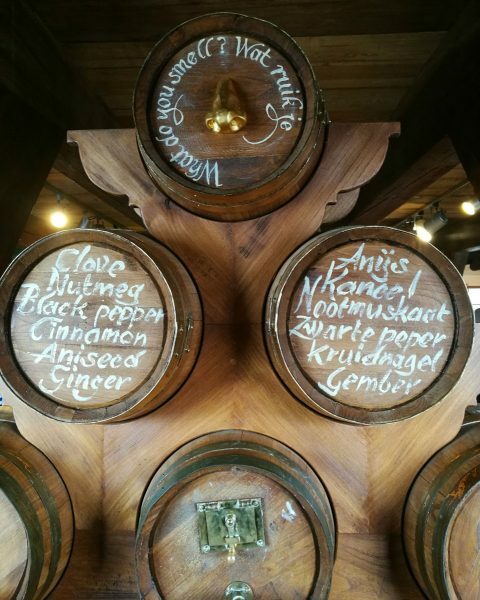 If you are craving more experiences at Zaanse Schans, there are still ways to have a great time without breaking the bank. 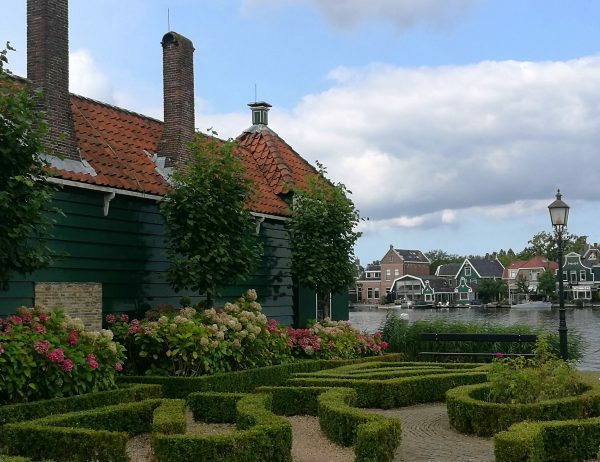 If you want to visit the museums that cost money (such as the Zaans museum, Coopery, Weaver’s House and Time museum then you should buy a Zaanse Schans card. 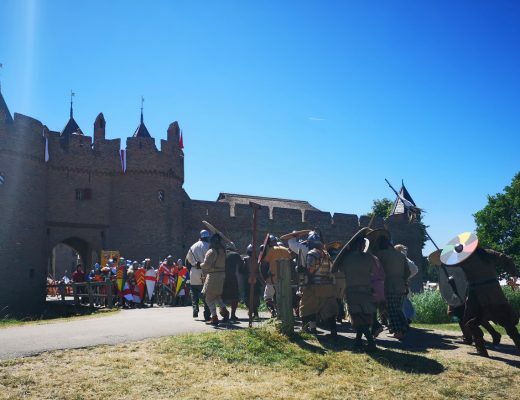 These cost €15 each for adults and include free entry to all of the above plus one of the windmills. 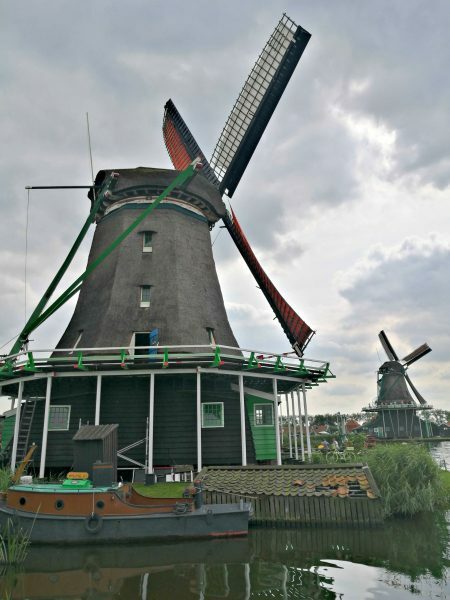 It also gives you a discount on parking; €7.50 per day instead of €10, 50% discount on entry to all the other windmills and 30% discounts on entry to the Windmill Museum, Honig Breethuis (a former factory house) and discounts on souvenirs. 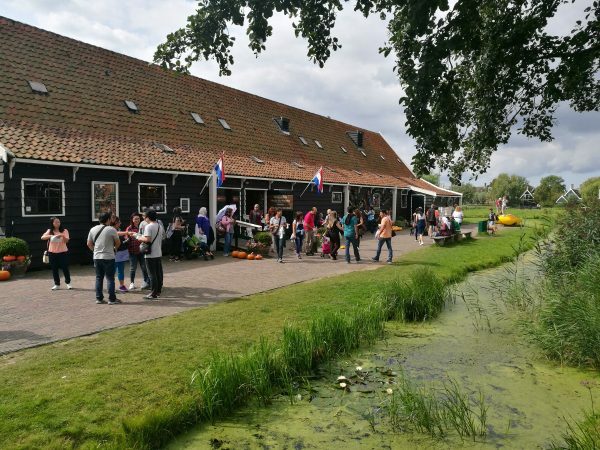 If you are looking to experience everything that Zaanse Schans has to offer then this is definitely better than paying individual entry for the different attractions. 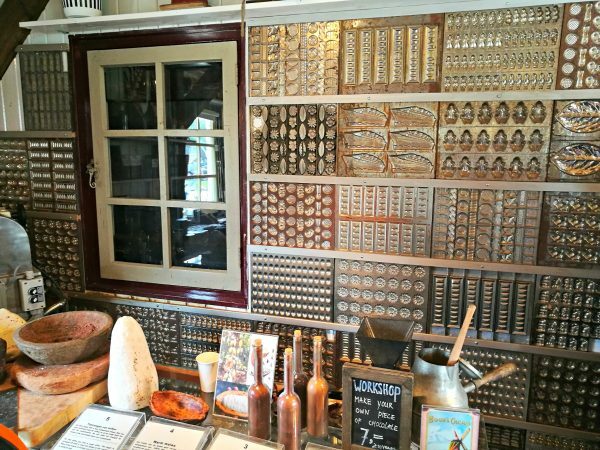 The Zaans museum also has a ‘Verkade Experience’ which shows you the history of chocolate and biscuit making, and is probably the main culprit for the delicious smells that permeate the area! 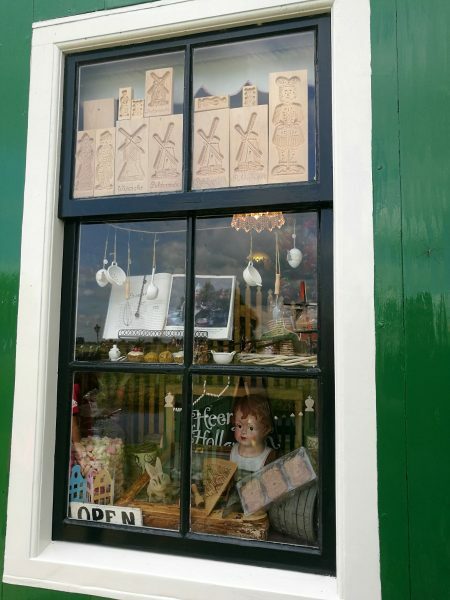 You can find out more about the Zaanse Schans card and all the other attractions here. 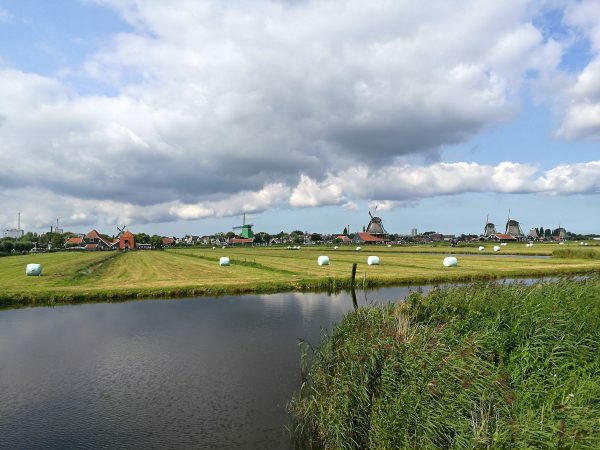 While thinking about writing this guide I looked online at AirBnB out of curiosity and found that there are lots of very nice and very affordable accommodation options near to Zaanse Schans. 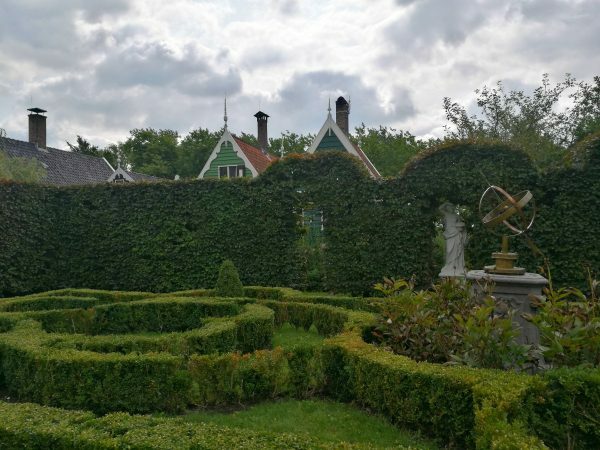 In fact, most of the places looked far more affordable than what is usually on offer in Amsterdam and since it’s only a short train ride away then basing yourself in Zaanse Schans and visiting Amsterdam might make your visit incredibly relaxed and idyllic! 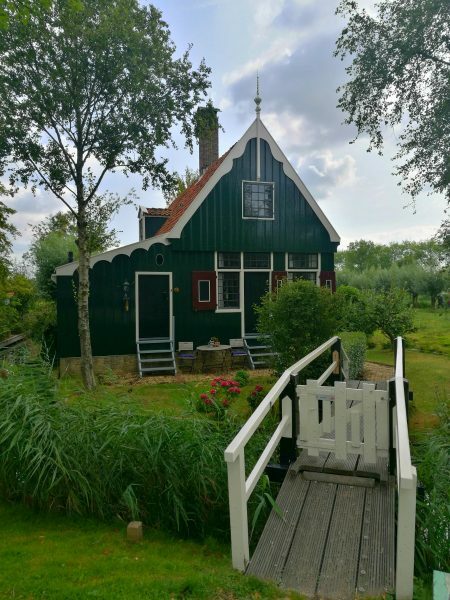 With just a quick search I found four fanastic looking AirBnB listings in Zaandam, all very close to Zaanse Schans, and they are all less than €80 per night! This gorgeous little caravan in a field made me kind of wish I could go back just so I could stay here. This BnB with attic bedroom is in a gorgeous spot, complete with charming garden. This pretty little green garden house looks cute and quirky and this modern apartment looks very chic. 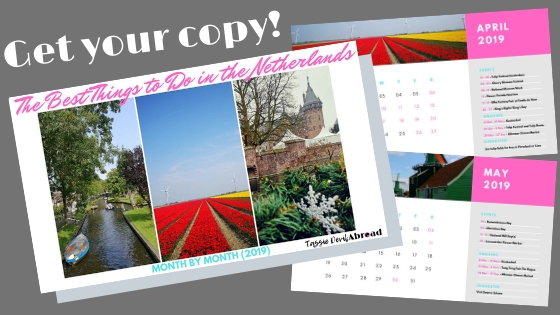 Want a free calendar of the best events in the Netherlands? I hope you’ve enjoyed this guide and it’s been useful for you. 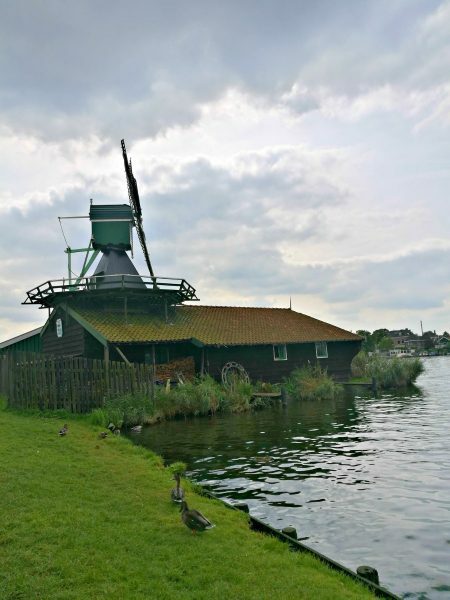 Have you ever been to Zaanse Schans? What was your favourite part? Let me know in the comments, or pin this for later if you are planning to visit this beautiful spot! What a helpful post! I spent 2 months in Holland this past year but didn’t make it here. It’s definitely on my list though! The clog factory looks amazing!!!! Thanks Sarah! 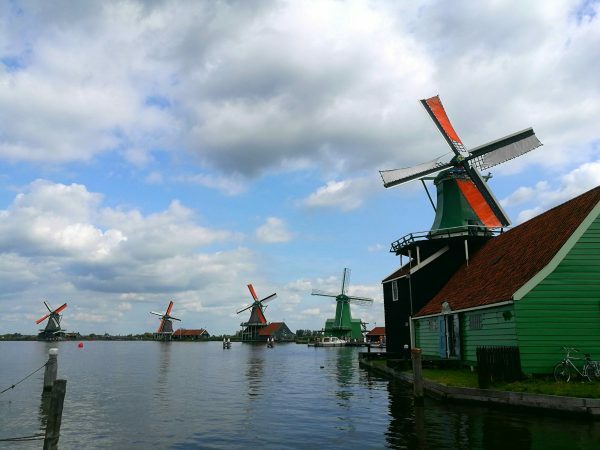 Hopefully you can come back one day and see Zaanse Schans too! Great collection of photos! 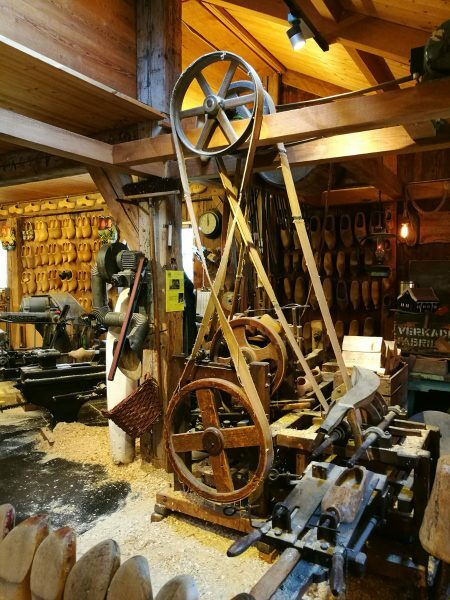 The clog factory is awesome! The carved shoes are amazing. And the cheese factory looks like fun, I love cheese. Thanks so much Lindsey! The whole thing really was so much fun! 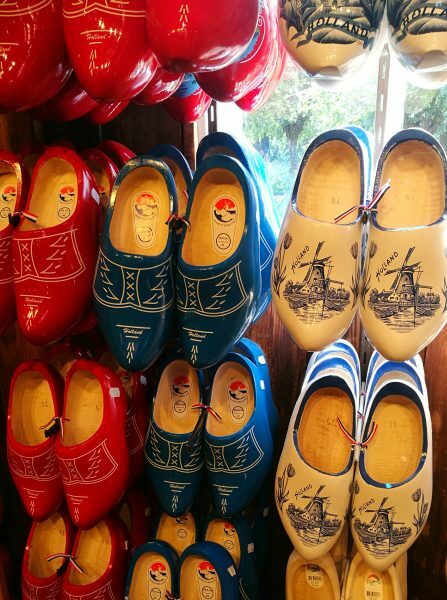 I would looove to have a pair of those clogs and taste Dutch cheese. Yum!! I blame you entirely for the clog dance earworm that’s currently visiting. 😉 But seriously, what a great place! We’ve been to Amsterdam many a time, but never thought of this as a side trip, and it looks as though there is plenty to do. Liking your suggestions for accommodation in the area too. Haha, sorry about that Bernadette! Yes this is a great trip to make from Amsterdam, it’s so close and lots to do! My husband and I met in Holland, and this was one of the first day trips we took together—12 years ago! We were just talking about going back there yesterday. Oh wow, what a nice little detail! I wonder how much it’s all changed since then?! It’s a lot of fun isn’t it?! We had so much fun exploring the windmills! I loved sampling all the cheese varieties (twice, shhhh! 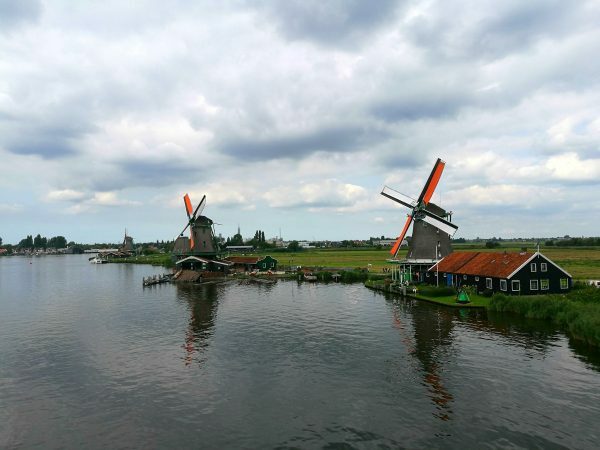 ), the views of all the windmills from De Kat, and we splurged on some of the pastries. SO good!